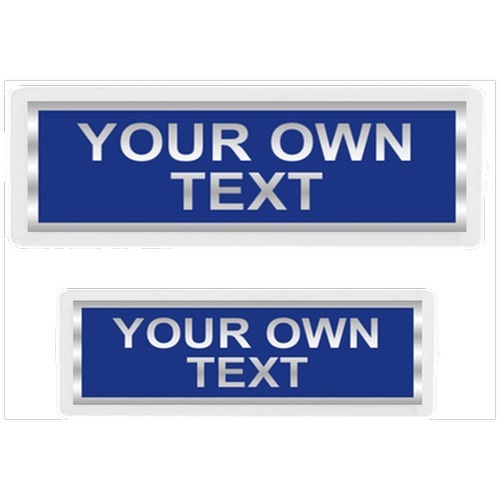 Badge only, is for use with encapsulated pockets (available for purchase separately). These can be a benefit to those with multi task titles. Sewn on, this is the same as above accept the cost includes the badge being sewn onto a garment, check with us first if you already have garments, so we may check they are suitable. Velcro backed, again the same as number one, except there is velcro (hook). added to the back, to allow the badge to be removed from any object hat has the loop part of velcro added. The loop velcro is not supplied. Manufacture takes 14 to 16 days from design approval. I just want to let you know that I have received the products ordered and I am very impressed with the quality and efficiency of manufacture and delivery and I look forward to doing repeat business with you and your company in the future.